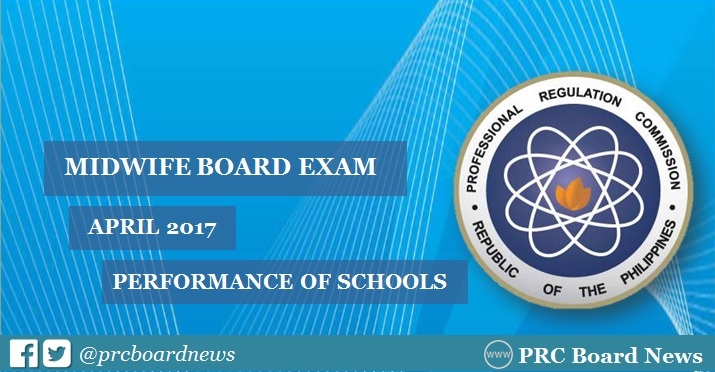 The Professional Regulation Commission (PRC) announced April 2017 Midwife board exam results to include the top performing school and performance of all schools on Tuesday, April 18. PRC has named University of the Philippines School of Health and Sciences - Leyte as the top performing school after garnering 96.30% passing rate or 52 out of 54 passed the exam. Camarines Sur Polytechnic College- Nabua ranked second with 92.06% or 58 out of 63 successfully hurdled the tests. PRC and the Board of Midwifery conducted the examination in the cities of Manila, Baguio, Cagayan de Oro, Cebu, Davao, Iloilo, Legaspi, Pagadian, Tacloban, Tuguegarao and Zamboanga on April 10 and 11. In the same period last year, Camarines Sur Polytechnic College (CSPC) - Nabua was hailed as the lone top performing school garnering 92.19 % or 59 out of 64 passed the exam. Meanwhile, none of the schools was reconized for the top performing school list in the November 2016 and November 2015 exam.